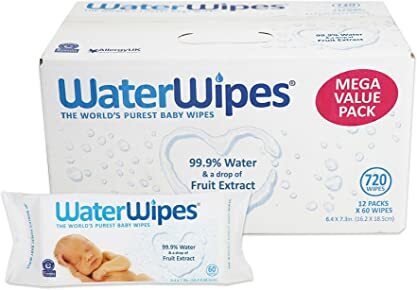 WaterWipes are a fresh product that contains 99.9% Water and a drop of fruit extract. Our wipes are manufactured in Ireland and our water is sourced from pure Irish Spring Water. WaterWipes are made with purified water and a drop of fruit extract. – Baby’s face and hands or a quick head-to-toe wash.
– Adults’ allergy prone and sensitive skin types. – General body skin care (for camping, hiking, picnic, sports etc). The world’s purest baby wipes – 99.9% water and a drop of fruit extract. Suitable for newborns. Effective yet ultra-mild, pure and gentle. When a baby is born, the outermost layer of their skin is incomplete, making their skin much thinner than adults. When it comes to ingredients, less is more. Conventional baby wipes use ingredients also found in bubble baths, shampoos, etc. WaterWipes are the baby wipe that parents and healthcare professionals have been waiting for. Cleaning a newborn baby’s delicate skin requires the mildest, gentlest care possible, to avoid skin sensitization problems. Thanks to WaterWipes, parents have the convenience of baby wipes with the absolute purity. With a clean, fresh non-greasy feel, they leave no residue on the skin. Free of alcohol, perfume, chlorine, formaldehyde, phenols, phthalates, SLS and SLES, lanolin and unnecessary additives.